Helion is a company that is coming on strong in a short amount of time. They wowed the tire loving crowd with some very cool ready-to-runs at great prices and with excellent service through HobbyTown retailers. 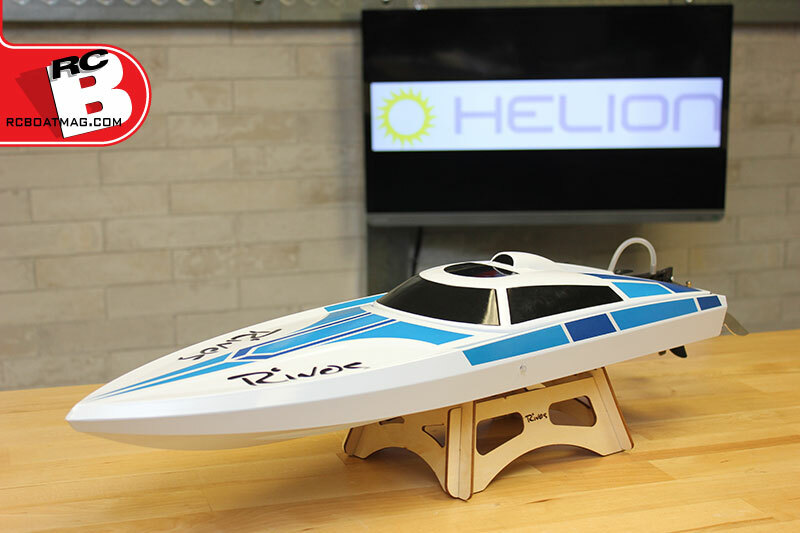 Then they dove into the water world with the Lagos Sport, a mini V-hull that was fast, fun and super easy to use and now Helion is on the move again. The latest addition to their boat lineup is the Rivos. This larger, 24-inch boat with a brushed 550 size motor and 7.2V NiMh battery is all built up in a complete RTR package and will once again have drivers hitting the water quickly and easily for some intense water roosting excitement. We checked it out on the RC Boat Reveal Bench. 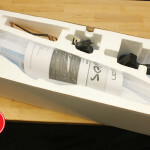 What’s in the box: Assembled boat, brushed motor/ESC system and electronics installed, 2-channel radio, wrench, spare prop, battery, AA batteries, charger, stand and manual. 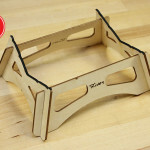 The Rivos comes completely assembled from the factory. 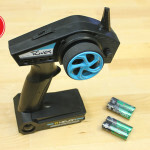 All you need to do is pull it from its cushy foam packaging, install the included transmitter batteries, charge the included battery with the supplied charger and then head to the nearest body of fresh water. The boat is a molded ABS hull, top deck and canopy. The decals come applied to the boat and the radio comes in similar color trim depending on whether you pick the red or blue version. The canopy secured nicely with a twist latch and foam on the top deck helps provide a seal. 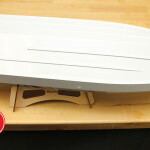 The shape of the hull is a Deep V with steps to help stability. The transom is braced with an inner wall. 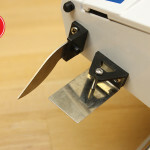 This keeps the rudder, turn fins and trim tabs held in place securely. We’re impressed that the fins and tabs on this sport boat are aluminum and the fact that the tabs are adjustable impresses us even more. 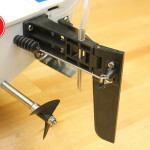 The rudder and its mount are composite plastic with the water pick-up tube placed in the mount. While the rudder does have a nice sharp edge, we did notice it’s not a fold-away type setup so make sure you don’t hit anything in the water or run the boat up on shore. 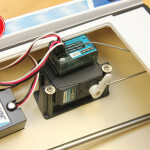 A simple pushrod exits the hull through a boot from the standard waterproof servo. 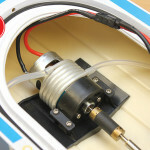 In the power department, a torquey 550 size motor gets power from a waterproof and water cooled 30A ESC. 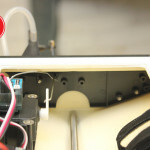 The motor drives a simple, solid prop shaft in a stuffing tube with a rubber coupler to reduce vibration. 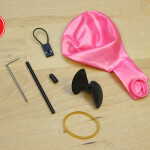 The prop is composite and an extra is supplied in case you need it. 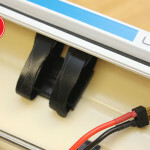 A coil water cooling jacket wraps around the motor to keep it cool during long runs. 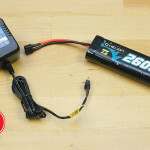 A supplied 2600mAh 7.2V battery with high powered T-connector gets strapped into the Velcro cradle after you charge it with the supplied wall charger. 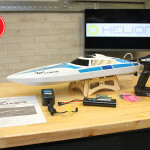 After the Helion Rivos was passed around the office, the crew gave this boat a thumbs-up for the quality and build from our bench-test point of view. Our only note is that it does not have any floatation foam in the front of the hull in case the boat takes on water. 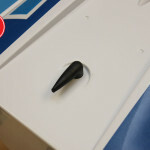 But we quickly realized that the foam packaging the boat comes in can be cut up and stuffed into the bow. We’re really excited to get the Rivos in the water for some testing. 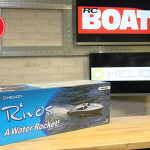 Check back in upcoming issues of RC Driver and RC Boat to get our additional thoughts on the features and performance of the Rivos.